It amazes me that even while we’re working hard on fall clean up, trying to beat the weather, that the excitement over next year’s blooms is so incredibly high! It seems I never get too burnt out to become excessively excited about new flowers. Getting ready for the next season while finishing up the last is a challenge and dreaming of the flowers to come sure helps! One of goals is to spread bloom time out over a longer period for as many flowers as we can. There are a couple of ways to this – succession sow or to plant different varieties. “Different varieties” are what gets me into trouble. My database already has 399 different varieties not counting dahlia, tulip, peony or lisianthus -those each have their own database. Another goal here is to plant enough variety that we can supply even the largest weddings throughout the season and give our customers a good selection. (Can you just hear the justification going on?) And if we diversify heavily, when something doesn’t do well one year, another variety (that word again!) will get us out of trouble, right? But my biggest justification is that I just love flowers. Stock – I love stock. I love its shape, the colors it’s available in, the earliness of her blooms, the vase life, it’s ruggedness, and there is nothing like the scent! A few stems in a bouquet are just paradise! So this year I went a bit nuts and I do believe I ordered every color available. I also swear I will get a fall planting in this year. I can just smell them as I type! Larkspur – We sold out of every stem of larkspur last year and so, like stock, we’ve really upped the number of plants and colors going in. It’s a fine, early flower, giving vertical height to bouquets without being overbearing. It also dries well which is an added bonus for those interested. The colors expand every year. Sunflowers – One of my favorite flowers (I know, they are all my favorites!) however, the vermin love them as much as I do. This year Charlie (the dog) and I vow to do much better! And, oh my gosh, I found some new to-die-for beauties ….drum roll! Plus the gazillion varieties I’m already in love with. I’ve narrowed the list down, but it was really difficult! Anemones– Another favorite spring beauty. We’ve added two new varieties this year- in a color mix of both types. Caryopteris incana is another favorite of mine. Although we grow some amazing Longwood and Grande Bleu blue mist shrubs, this variety is grown here as an annual. It has a more intense blue color and a bit of a different stem design. The seed has been hard to find for a few years now and I was so excited to see it available again! I just have to figure out where it will go…. Hyacinth Bean – I stopped growing this years ago because it doesn’t flower heavily for us. It’s worth trying again and, even without blooms, the vine is lovely. Lisianthus – Every year I say I’m going to cut back on the lissies; if not the number of plants, at least the number of colors. They are very labor intensive and slow, slow, slow to start….. but oh my gosh, they are my favorite! (Really this time….?) What other flower is truly as beautiful, other than a garden rose? So, of course, we have added a few new varieties for 2018. Flowers anonymous here I come! Ranunculus – Super Greens and Amandine. Our weather is not very conducive to growing ranunculus since, like all of us, they like it not too hot and not too cold. But being stubborn, we’re going to give it another try this year. Love! Peony – We’ve got around 160 peony plants now, so I behaved sanely and only added Red Charm this fall. In anticipation of an abundant harvest this coming spring (70 of our newer plants will reach their 4th year), we have also lowered the price! 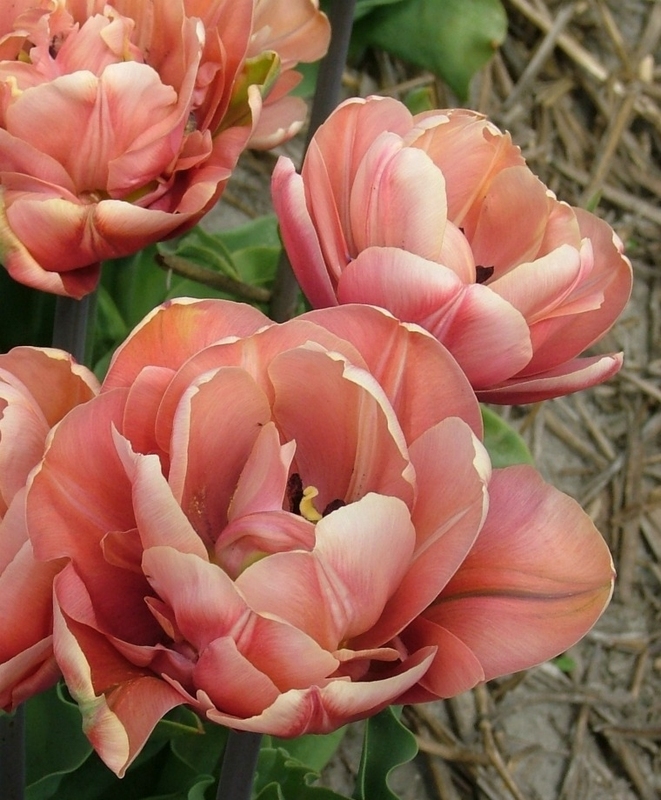 Tulips – We sold out before the end of Mother’s Day last season, so we tripled the amount of bulbs planted this fall. Oh jeeeeeez. How do you even decide? I narrowed it down to 18 varieties. I think am most excited about having more La Belle. These were a huge hit. Or no, maybe Charming Beauty. Or maybe Orange Princess…. So until spring, we can dream in flowers!